Funky laptop bags are not for everyone or any occasion but laptop bags do not have to be "black and boring" all the time. Many people own more than one laptop bag and number of laptop covers and sleeves. They own a "conservative" looking laptop bag and covers for formal occasions, like work and business. This usually means traditional laptop case in black or brown color. It can still be a stylish laptop bag, black does not have to be "boring". While the cool laptop cases are for "private" use and tend to reflect the owners' personality and style more. Funky in the case of fashion means something modern and stylish in an unconventional or striking way (Google definition). Funky laptop bags can be colorful, fun, fashionable, unusual, controversial, humorous, quirky, provoking, pretty, eccentric... but they are always cool and stylish. 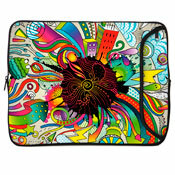 Funky laptop bags and covers are ideal accessories for those that dare to be different. There are number of laptop luggage brands that specialize in trendy and funky laptop bags. This article looks at some of them in more detail. The aim is to assist you to find the right funky laptop luggage brand for your style and budget. Just click on the relevant laptop luggage brand to see their range of laptop bags. Amy Butler is an artist and designer that specializes in patterns and fabrics, which are then used in wide range of products including in fashion and travel bags. You can also get Amy Butler sewing patterns, fabrics, handcrafted wool rugs, wallpaper, customized wall art, etc. Amy Butler seeks inspiration in the simple texture of everyday things, including nature and animals and she likes to travel for inspiration. Her patterns are colorful and busy but subtle at the same time. Amy Butler laptop totes are basically funky handbags that you can fit in a laptop. You can get typical Amy Butler laptop covers as well, i.e. with her distinctive patterns on the inside and outside of the cover. You can also get more "conservative" looking cover, i.e. in solid color externally but it becomes Amy Butler laptop cover once you open it. Clark & Mayfield laptop bags are modern and stylish in a striking way (so we use the Goggle definition of funky). Or like their tagline says... functional bags for the fashion-savvy woman. Clark & Mayfield bags offer the style of a designer handbag but with the functionality to replace both briefcase and purse. 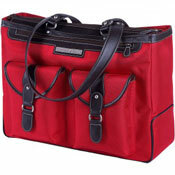 This has made Clark & Mayfield laptop bags popular among young professional women. The style is feminine and classic but the colors are still vibrant, making Clark & Mayfield both funky and stylish laptop bag for women of all ages. Designer Sleeves design is definitely funky and fun but it is also very functional. 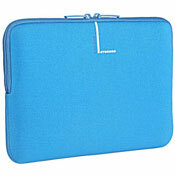 Designer Sleeves laptop cases are made of durable neoprene rubber that gives maximum protection, i.e. the cool feel of the wet suit material provides natural moisture, shock and scratch protection. Designer Sleeves also uses patented process to embed the external printed artwork permanently to the fabric, i.e. the ink will not crack or peel and is 100% washable. We at B for Bag really like the Designer Sleeves style and feel everyone should be able to find Designer Sleeves laptop case to fit his or her personal style and circumstances. There are some really funky and outgoing designs available but also some more laid-back styles. And the price is great too. Hadaki target markets are students, young professionals and anyone that appreciates fun and funky design. Hadaki products are eco-friendly, made of quality materials and fine workmanship and are easy to maintain... while still being affordable and fashionable. Hadaki offers wide range of laptop messenger bags and sleeves. The design is colorful and definitely fun and funky. Hadaki bag is as much fashion statement as laptop bag... at very affordable price. 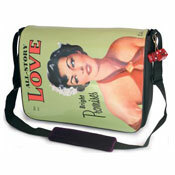 Mobile Edge offers wide range of funky laptop bags, i.e. 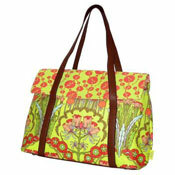 messengers, totes, iPad covers, laptop sleeves, backpacks, etc. Their mission statement is to create cutting-edge carrying cases for mobile lifestyle while reflecting the user's personal sense of style. The Mobile Edge style varies somewhat. Some bags are classic and stylish while others are more trendy and funky. But they are always cool laptop cases... and the price is great. Tucano is Italian design... do we need to say more? Tucano design is truly modern and stylish in a striking way. Tucano aim is to achieve the balance between practicality, ergonomics, maximum protection, and cutting-edge look. In our opinion, they have achieved this... and the price is great too. 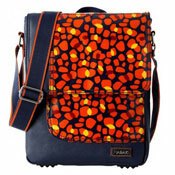 Tucano are truly funky laptop bags and covers... in a stylish understated way.